Santa Rosa Dunes 7724 is professionally managed by ResortQuest by Wyndham Vacation Rentals. Treat yourself to a much needed, relaxing vacation on the coast of Florida at Santa Rosa Dunes #724 a 2 bedroom, 2 1/2 bath townhouse. 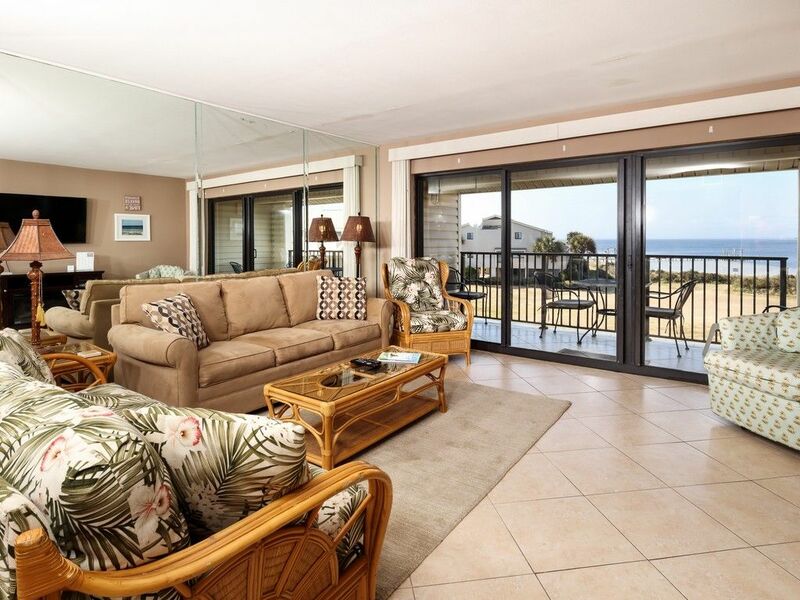 This Pensacola Beach vacation rental offers comfortable accommodations for up to seven people. It is a great choice for a family getaway or a vacation with a group of some of your dearest friends. Santa Rosa Dunes #724 features a spacious living room containing a large flat-screen TV and a Blue-Ray player on the first floor. You will also find a fully equipped kitchen, decorated with stunning granite countertops, an open dining area, and a half bathroom. Venture out on your balcony and enjoy the view of the bay while you spend quality time with your friends or family members. Walk upstairs to the second floor and you will find the master bedroom containing a king bed and a second bedroom furnished with a queen and a twin bed. Each of the two bedrooms offers an adjoining, full bathroom. Go for a swim in the community pool or go for a walk down the pier and try your luck fishing in the bay. Play a friendly match on the tennis courts or strike up a leisurely game of shuffleboard with your vacation group. Take a short walk over to the gulf and spend your days relaxing in the sand. Great stay with the family! Enjoyed our stay. Place was very clean and had enough room for all. Also very convenient just across from the beach and near all restaurants. We are so happy to hear you enjoyed your stay at Santa Rosa Dunes! Your guest experience is our top priority. Thank you for taking the time to write a review about your vacation after you returned home. We hope you are able to visit again soon. I stayed with my family including my one year old. They need to get a better cleaning service. Floors were very dirty. It was poorly vacuumed. My son almost ate a pill (medicine) he found on the floor. I was expecting more on that sense. Other than that. Good location, spacious and comfortable bed at the master bedroom. 2nd floor was hotter, but nothing we couldn’t handle. Alexandra, thank you very much for the feedback regarding your recent stay at Santa Rosa Dunes. Your guest experience is very important to us, and we will certainly forward your comments to the property to review the issues you reported. Our team is committed to making sure our guests have positive beach memories for years to come, and we look forward to the opportunity to serve you again. My son and pregnant new daughter-in-law had to leave after 3 days because the heat upstairs didn’t work and she had to try and sleep on cushions and on the couch. This eventually caused her to get sick. I’ve never paid this much for a room. I saved for 2 months, and it was ruined because of the room. VERY DISAPPOINTED!!! Thank you very much for the feedback regarding your recent stay at Santa Rosa Dunes. Your guest experience is very important to us, and we will certainly forward your comments to the property to review the issues you reported. Our team is committed to making sure our guests have positive beach memories for years to come, and we look forward to the opportunity to serve you again. Comfortable beds, fully equipped kitchen, wonderful view of the sunset. Michael, we are so happy to hear you enjoyed your stay at Santa Rosa Dunes! Your guest experience is our top priority. Thank you for taking the time to write a review about your vacation after you returned home. We hope you are able to visit again soon. The property was superb. Exactly as advertised & pictured. View from the balcony was stunning & the beach was extremely close. The resort even furnished umbrella & chairs on the beach. There was only one problem - we had to leave! Thank you so much for sharing your very welcoming home with us. Beautiful view, clean, everything you need to relax and enjoy. Bobbie, we are so happy to hear you enjoyed your stay at Santa Rosa Dunes! Your guest experience is our top priority. Thank you for taking the time to write a review about your vacation after you returned home. We hope you are able to visit again soon.